Fuyoh Kobayashi is a master calligrapher and owner of the famed Shoraian restaurant in Japan. 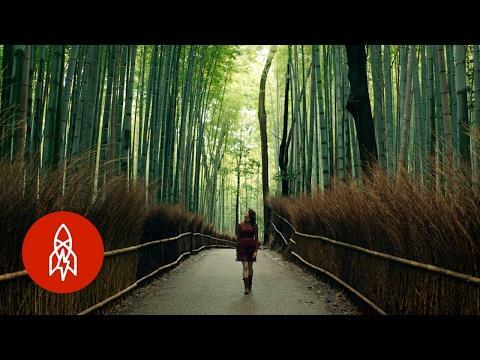 Located in Arashiyama, Kyoto, Shoraian is perched on the edge of a mountain overlooking the Oi River and can only be reached by foot. To call Shoraian simply a restaurant sells it short. Visitors come as much for the celebrated food as they do for the sense of peace that this spiritual, otherworldly setting offers. This Great Big Story is a paid contribution by ANA. (https://www.ana.co.jp/wws/uk/e/wws_common/promotions/bydesign/meal.html). SUBSCRIBE: https://goo.gl/vR6Acb Follow us behind the scenes on Instagram: http://goo.gl/2KABeX Make our acquaintance on Facebook: http://goo.gl/Vn0XIZ Give us a shout on Twitter: http://goo.gl/sY1GLY Come hang with us on Vimeo: http://goo.gl/T0OzjV Visit our world directly: http://www.greatbigstory.com Great Big Story is a video network dedicated to the untold, overlooked & flat-out amazing. Humans are capable of incredible things & we're here to tell their stories. When a rocket lands in your backyard, you get in.